Rollerball, Ballpoint, and Fountain pen–they all have their roots in dip pens. Today, most dip pens have metal nibs. However, there’s one type of dip pen that is very unique because it’s made of glass. 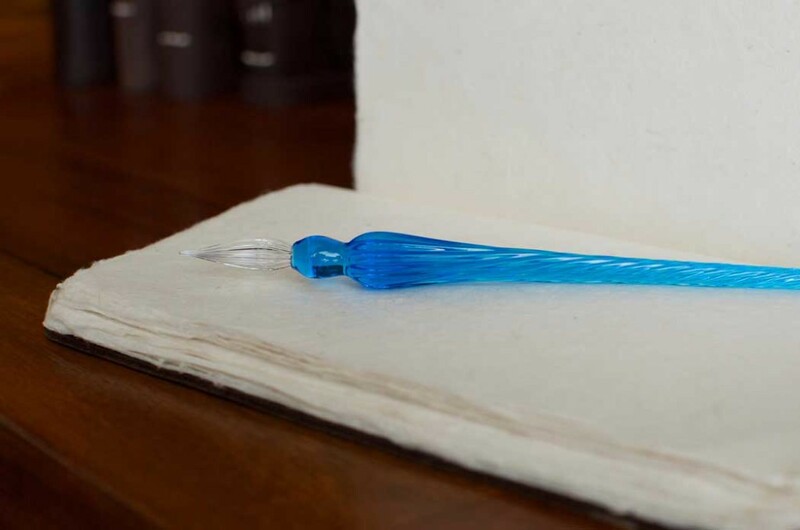 Glass Dip Pen – Dip it. Dip it Good. A quality glass dip pen exudes a unique elegance envied by all other pens. Believe us, we know. Our other pens tried to talk us out of using it, but use it we did, and do. If you’re considering using a dip pen on lokta paper, a glass dip pen is a great option as they don’t catch the paper fibers as do some regular dip pens used for calligraphy. 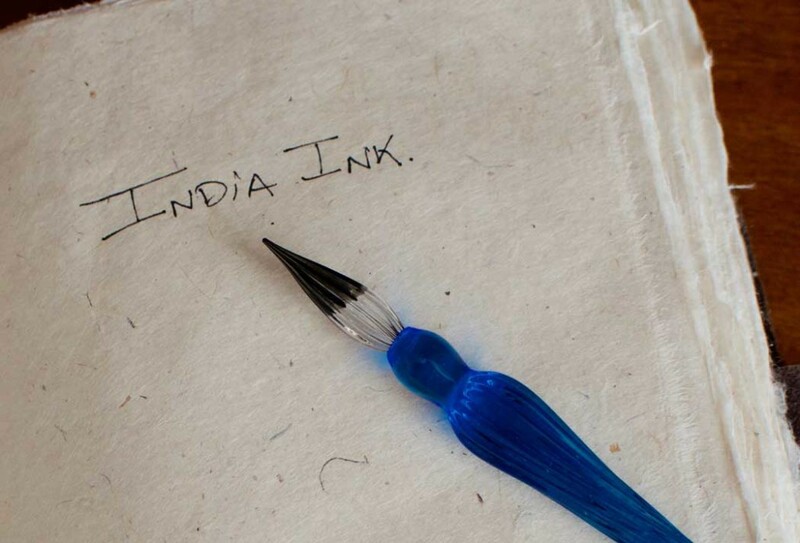 India ink is a pigmented ink used for dip pens. It’s just the right consistency for pens that are dipped and then applied to the paper. India ink should not be used in fountain pens or else it can gum them up. It’s formulated for dip pens. India ink brands like Speedball can be found in craft stores or online. How in the World do you use a Glass Dip Pen? All you need to do is dip the clear nib of the pen into the inkwell, get off any excess ink by touching it to the inkwell, and then start writing. 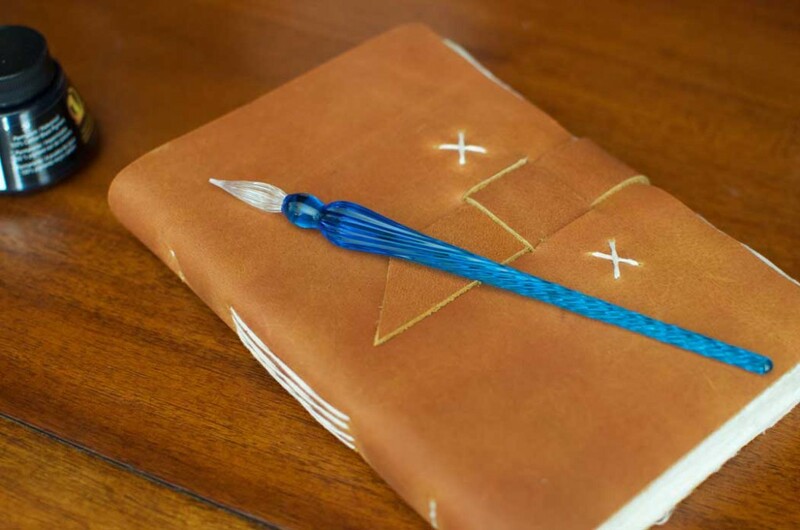 If you’re a little nervous about dripping ink on your desk, place a piece of a paper under your inkwell and place your journal nearby or on top of the paper. Glass dip pens are different than any other pen out there. It takes a little getting used to the feel and the sound, but its use can be an enjoyable process even meditative between writing lines when the dips in the inkwell are required. Are Glass Dip Pens Just a Novelty? Compared to a regular dip pen that needs to be dipped every few words, glass dip pens don’t require as much dipping. The flutes in the nib store the ink until drawn out along the paper when writing. It’s surprising how much ink the the pen “reservoir” can hold. A little trick, when the ink starts to run low, is to rotate the pen slightly in your hand, and you’ll get more ink from the other side of the pen. The lines from a glass pen are fairly uniform, so you won’t get that great calligraphy styling as when using a metal dip pen, but as a choice for lokta paper, the glass dip pen is the one of the best performing of all dip pens. A little water and soap get the ink off really well with the help of a paper towel. That’s the nice thing about the glass dip pen is that it’s a really easy clean. Because it’s easy to clean, a glass dip pen makes testing or switching between inks very easy. You can use fountain pen inks with a glass dip pen. Those inks may flow a little faster (depending on the ink) than India ink, but they’ll work with the pen just fine. Just be sure to clean the nib well before switching inks. Other than cleaning, there’s not much else you need to do. Some enthusiasts suggest if the ink doesn’t flow as good to use some sandpaper on the tip of the nib. Ours works just fine without doing that though. Should you get a Glass Dip Pen? That’s up to you. If you have some inks you want to test out quick, or just want the feel of an extremely unique writing instrument, a glass dip pen can take your writing experience to a whole new place. For other pen options, check out our pen guide. Be aware that glass dip pens come in different sizes with some being quite small. We like using a 18cm (7 inch), glass dip pen. With various colors, styles, and sizes, the options are almost limitless.